SARASOTA, Fla. – University Park Country Club has a lofty reputation to live up to. University Park Country Club in Sarasota is always listed near the top of any rankings among golf courses on the west coast of Florida. 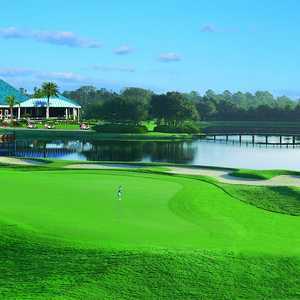 Always near the top of any rankings among golf courses on the west coast of Florida, University Park offers 27 holes that, while nowhere near as difficult as Concession Golf Club, which is only a mile away, still can bring the best golfer to his knees. Before you even tee it up for the first time, University Park offers the kind of customer service that other courses in the area don't often match. All 27 holes were designed by Ron Garl, who builds his courses with an emphasis on making his courses tough for those who tee it from the tips and a lot easier for the shorter hitters. He designs his courses with the medium white tees as the focal point, and University Park is a perfect example of Garl's work. Play if from the tips if you want, and you are looking at about 7,200 yards, depending on which pair of nines you play. Each of the three nines offer pretty much the same challenges, so it really doesn't matter which two you play. They all bring water into play along with plenty of trees and mounds on the side of nearly every fairway. The nines aren't really that distinct as a whole, but all 27 holes are unique, and there aren't a lot of easy pars out there. University Park General Manager Charles Varah said he appreciates Garl's approach to designing courses and that it fits well with his members. "We have golf for every level of play, and we don't try to torture you when you get out here," Varah said. "If you want to play from the tips, that's great; but if you want to have fun, it is set up fairly, and we don't want anybody to feel tortured. It can be tough, but it is fair. No one wants to go out and torture themselves for four hours, do they?" University Park Country Club considers itself a 27-hole golf club. The third nine might not be much different than the other two, but they are considered No. 19 through 27. You can request the two nines you want to play, but if the day is wide open, try to get in all three. It's worth the time. Start with the first nine. Lots of trees, tight fairways and bunkers everywhere. You start to feel the bite of University Park on the third hole, a 458-yard par 4 that can be reached in two with a strong left-to-right drive around a dogleg into a tight fairway. It's easy to take a chance to avoid the trees on both sides, but it leaves for a long approach to a tight green. The ninth is only 422 from the tips, but the approach leads to a green surrounded by water on the left side. Playing to the right is safer, but missing the green requires a downhill chip that, without great touch, will get you wet on the other side. Holes 10 through 18 are much of the same. Tight fairways, small greens without much undulation, but there's still trouble. The 14th hole is a 536-yard par 5 with bunkers everywhere and is almost impossible to reach in two. Lay it up here or spend some time on the beach, because the green is tightly guarded. No. 17 has the tightest fairway on the course with water all the way down the right and mounds and trees to the left. The green of this 403-yard par 4 is surrounded by sand. University Park Country Club's last nine, holes 19-27, aren't any easier -- plenty of water and even more sand. No. 23 is a long par 4 with trouble everywhere. It's 468 yards from the tips and being straight is the only option. 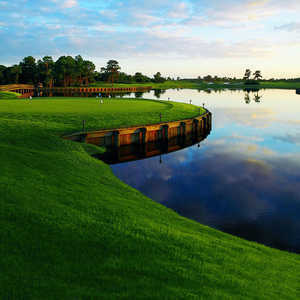 If you make it through all 27, the 18th is a benign hole with a short walk to the clubhouse where the Lakeside Cafe offers casual dining overlooking the ninth and 18th holes. There is also the University Park Golf Academy that includes two- and three-day classes as well as daily clinics and classes for kids. 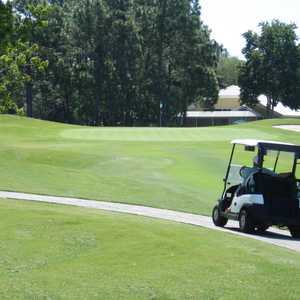 At the recent International Network of Golf conference in Tampa, guests Lee Harvin and Maury Chandler said University Park Country Club was as good as any course they have played. "Not a dull hole on the course," Harvin, who made the trip from Atlanta, said. "I played all 27 and am beat right now, but it's a great round of golf. I'd love to come back." "A lot of people say all Florida golf is the same but not here," Chandler, also from Atlanta, said. "This was fun, and there's something different about it. It is challenging, and it doesn't beat you up." With 27 holes, it can make for a long day, but it's worth it. It's a course that isn't designed to break your spirit, but it offers a fun day with the best customer service anywhere in the area. Keep the drives straight, even if it means dropping down a club. The greens are friendly, but stay out of the sand. The extra two hours is worth it to play 27.